Here are a few reasons why the BlackBow rig makes for a better day on the water. The BlackBow Rig is easier to use because it simply cannot become an entwined, tangled mess. The BlackBow rig gives its user exceptional control over the mini-traces and their razor sharp hooks. The position of the lures are restricted by the length of trace to the attachment point on the bow. 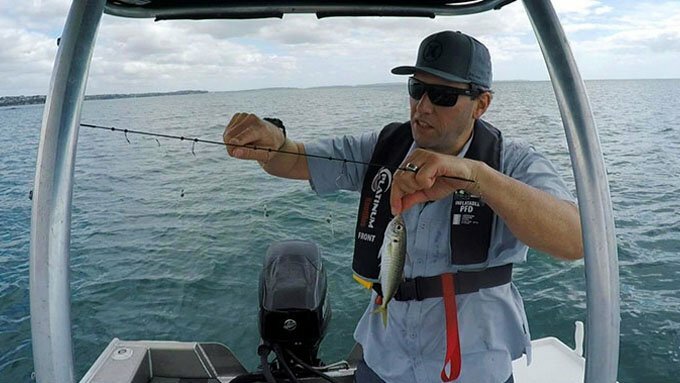 If you're dealing with a fish on one end of the rig, you can safely presume that a loose hook on the other end of the rig is going to stay where it is. You can setup the BlackBow and be fishing in seconds. The metal eyelets on either end of the rig provide quick and easy attachment points for sinkers at one end and your mainline at the other end. The entire rig will simply slide out of the travel tube and it’s ready to go. The travel tube is an essential part of the BlackBow system. It provides storage for the bow while it is rigged with its mini-traces, putting the small sharp hooks out of harm's way. The whole rig can easily be stowed into the tube in seconds. Its long slim rigid form factor means it won’t really fit into anyone's tackle box, but anyone with a tackle box will usually have other 'long, slim, rigid’ pieces of equipment requiring transport and storage so the BlackBow should be kept with them (your fishing rods). The BlackBow travel tube also doubles as an easy cleaning system. With both end caps removed and the BlackBow in the tube, just point a garden hose down one end of the tube and shoot a jet of fresh water through it to remove any remnants of sea salt and organic material. If the BlackBow is kept clean and dry when not in use, it will last longer. The majority of the parts are made of carbon fibre and plastic which are corrosion resistant. The mini-traces are parts that will see the most wear and tear and they are designed to be easily replaceable at a low cost. Conventional sabikis are generally considered to be a disposable item because they are fairly difficult to store, their hooks deteriorate quickly and quite often they become so entangled that it’s easier to just throw them away. This is 'okay' for the hooks which are biodegradable but each sabiki can have up to 2 metres of monofilament line, which is not biodegradable. The BlackBow and it's mini-traces are designed to be used again and again and again. This means you're putting less of the bad stuff into the environment so you can sleep easy at night. While you’re busy saving the environment by re-using the BlackBow several times over, you will end up saving money. Every bait fishing session made with the same BlackBow setup is another sabiki you didn’t need to purchase, saving $3-$10 each time.